When Gaudí took charge of the restoration of Bellesguard (1900-1909), he planned a set of maximum harmony with the landscape, centring it on the cross, of which the house is the pedestal and this viaduct a visual frame. To preserve and to complete the fragments of both medieval towers, he turned aside the public way that was going of the village of Sant Gervasi de Cassoles (today, a neighborhood of Barcelona) to its cemetery (that today has remained placed upper the Ronda de Dalt). 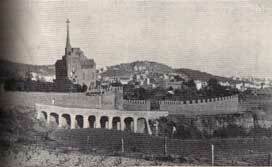 The new section of way was passin laterally the torrent of Betlem, a torrent (today blurry for the urbanization and the houses) that goes down Collserola's mountain, in the north slope of Vilana's saw; and Gaudí designed a viaduct. It was constructed between May and August, 1908 and it is very similar to those of the Park Güell, had done some years before. It’s supported by ten columns in the shape of leg of elephant, all different, inclined towards out and with the capital without solution of continuity with the shaft. The vaults finish in the side objected in the natural bank of the mountain, forming the set a funicular profile, a mechanically perfect structure that leads the weight of the viaduct to the soil without any diversion. 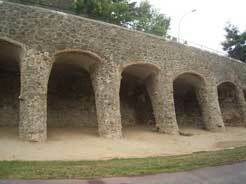 And also like in the Park Güell, Gaudí did not leave the bricks of the work at sight. He covered the columns and the vaults of brick with rustic local stone. He was following the example of the Nature, which covers the bony structures with meat and the woody ones with bark. The magazine "La Hormiga de Oro" published a photography of the « hermosísimo conjunto en el que no se sabe si admirar más la mano del artífice en cada uno de los pequeños detalles, o en la disposición del vasto panorama vigoroso y sobrio que a todos lados se divisa». Joan Bergós, in the magazine "La Paraula Cristiana", commented: «És l'exemple més bonic d'aprofitament dels materials of the terreny that que he vist». The viaduct is nowadays the street Bellesguard, just in front of the entry of the estate.